I’ve been reading Joseph Ceravolo’s The Green Lake is Awake, in anticipation of his Collected Poems due out in December, and have been comparing his elliptical and always surprising approach to natural things to, for some reason, Paul Blackburn’s hyper-urban odes. I’m a late arrival to Ceravolo, and was an early arrival to Blackburn, so perhaps they create convenient sort of mental bookends. Ceravolo is more lyric than Blackburn, but less obvious, yet still immediate in his language, which makes it clear that how the poem is composed aesthetically always comes first, ahead of any “likeness” to nature. A line I jotted down, for its sheer shocking originality that unfolds into multiplicity of potentials: “I speak as a wife to the capsizing.” Then his sense of sound, even in a title such as “spring in this world of poor mutts,” which was recommended to me, and which I misheard as “spring in this world of four months,” which made just enough un-sense to keep me thinking about it (lines that are perfectly resolved in both sound and sense are easily forgotten). He names the CIVETTA LINK-BELT “graceless,” and I suppose it was, but I love that he used its name, in all caps even, in his poem. Cities are full of words like KALMON DOLGIN, in all caps, published on the sides of buildings, but unused (unusable?) for poetry. KALMON DOLGIN is a real-estate company, sure, which holds the possibility of litigation for any poet who uses their name in vain, but it’s also a compelling combination of two rather mysterious six-letter words with an odd assonance, like CIVETTA LINK-BELT. I wonder what Blackburn would have thought about some of the art and poetry walks lately taking place. There’s the East Village Poetry Walk, Elastic City, The Office of Recuperative Strategies, Jon Cotner and Andy Fitch’s Ten Walks/Two Talks, Erik Anderson’s The Poetics of Trespass, a personal favorite, in which he inscribes the word “PASTORAL” into the Denver cityscape. As ever, I see a need for female flaneurs to deepen the inscription of their footsteps onto the urban canvas (Brenda Coultas is a great pioneer.) So far, they may do so in new ways, more engaged, more judgmental (and I mean that in a positive, affecting-change sense). 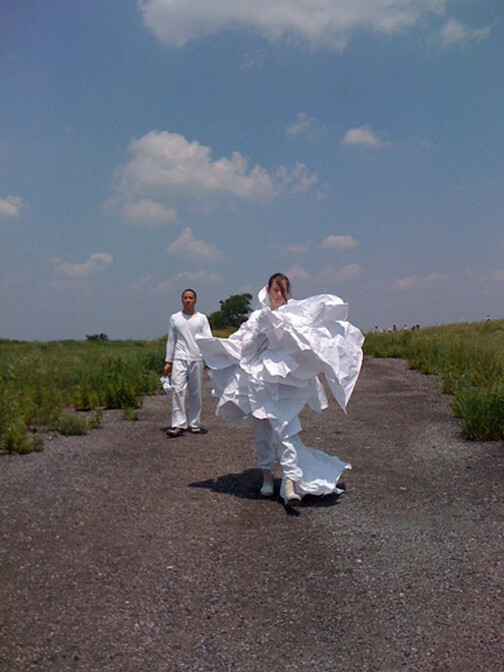 I think of PARK, Jennifer Scappettone’s collaboration with choreographer Kathy Westwater on the Fresh Kills Landfill in Staten Island, which carries the “walk” into a dance, a collaboration with the landscape, rather than the more typical stroll of the flaneur.